This RTD plug sensor is ideal for pressure vessel applications, pressurized containers and applications requiring a temperature sensor with an NPT mounting fitting. The single element design has a 1/4" diameter, 304 stainless steel probe that extends 1/2" from a 1/4"NPT mounting thread (optional 1/8"NPT mounting thread also available). Leads are 6' long, stranded #26 AWG nickel plated copper, PFA-insulated & jacketed with steel overbraid. Sensors are supplied with or without subminiature connectors. Pressure rating is 2500 psi., and the maximum temperature rating is 230°C (445°F). 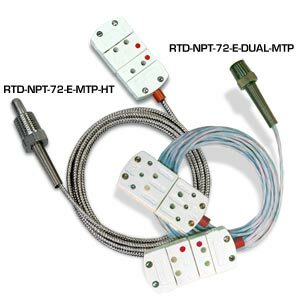 Dual RTD pipe plug probes come standard with flush sensing surfaces which minimize interference with moving parts, and 1/8"NPT mounting threads (optional 1/4"NPT mounting threads also available). The leads are 6' long, stranded #26AWG nickel plated copper, PFA insulated & jacketed cables with miniature connectors on each cable. 100Ω Class "A" DIN Platinum, 72" Long PFA Insulated Cables with Steel Overbraid and Stripped Leads, 1/4 NPT Mounting Thread, 230°C (450°F) Max Temperature. 100Ω Class "A" DIN Platinum, 72" Long PFA Insulated Cables with Steel Overbraid and Miniature Male Connector, 1/4 NPT Mounting Thread and 230°C (450°F) Max Temperature. 100Ω Class "A" DIN Platinum, 72" Long PFA Insulated Cables with Steel Overbraid and Miniature Connectors, 1/8 NPT Mounting Thread and 230°C (450°F) Max Temperature. 100Ω Class "A" DIN Platinum, 72" Long Fiberglass Insulated Cables with Steel Overbraid and Miniature Connectors, 1/4 NPT Mounting Thread and 480°C (896°F) Max Temperature. 100Ω Class "A" DIN Platinum, 72" Long Fiberglass Insulated Cables with Steel Overbraid and Miniature Connectors, 1/8 NPT Mounting Thread and 480°C (896°F) Max Temperature. Dual 100Ω Class "A" DIN Platinum, 72" Long PFA Insulated Cables with Miniature Connectors, 1/4 NPT Mounting Thread and 230°C (450°F) Max Temperature. Dual 100Ω Class "A" DIN Platinum, 72" Long PFA Insulated Cables with Miniature Connectors, 1/8 NPT Mounting Thread and 230°C (450°F) Max Temperature. Dual 100Ω Class "A" DIN Platinum, 72" Long Fiberglass Insulated Cables with Seel Braid and Miniature Connectors, 1/4 NPT Mounting Thread and 480°C (896°F) Max Temperature. Dual 100Ω Class "A" DIN Platinum, 72" Long Fiberglass Insulated Cables with Steel Overbraid and Miniature Connectors, 1/8 NPT Mounting Thread and 480°C (896°F) Max Temperature. 4 to 20 ma RTD Connector-Transmitter™, Low Range, Miniature Size Connector.